Jacob Nottingham went 2-for-4 with a single and a double in the Brewers' 4-3 loss to the Marlins on Monday. The single was Nottingham's first career hit, and he followed it up with a double his next time up. Nottingham was called up to take the roster spot of Manny Pina, and was mashing at Triple-A before his promotion. 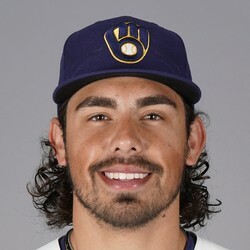 He was hitting .303 with 10 home runs and a .267 ISO in 182 PA. Take those numbers with a grain of salt because the Brewers' Triple-A team is in Colorado Springs, which is akin to playing at Coors Field. Still, the Brewers have gotten a combined 71 wRC+ from their catchers this season, so if Nottingham hits he could have staying power.